Today we have my second favorite strategy game of the year. The odds were always good that I was going to enjoy this one! 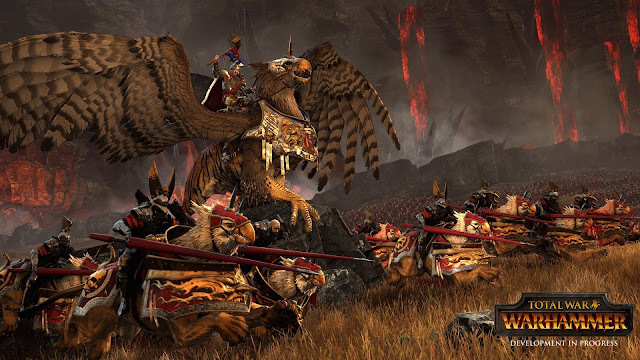 Total War: Warhammer comes from a franchise I have always enjoyed, and adds in an IP that has been near and dear to my gaming heart for over two decades. Thankfully it was also a damn fine entry in the series. I had been a little concerned given the last couple of historical installments had left me cold (probably in similar ways to that I talked about earlier in the week), but the respect with which they treated the license elevated this one for me. It is still a Total War game, with the now familiar two level of game-play. A large strategic world map that plays out like other 4X strategy games, and then the real time battles that the series forged its name upon. Both parts benefit from the added fantasy elements that the Warhammer license affords them. The addition of heroes, items, and magic is well handled. It feels impactful, without marginalizing the unit combat that forms the bedrock of the real time sections. Most importantly however, they perfectly capture the atmosphere and feeling of the setting. All of the races play and feel like fans of Warhammer will have expected, and are positively packed with character. Pretty much everything felt right about this one. Recommended if you're a fan of the series, or of the Warhammer license.